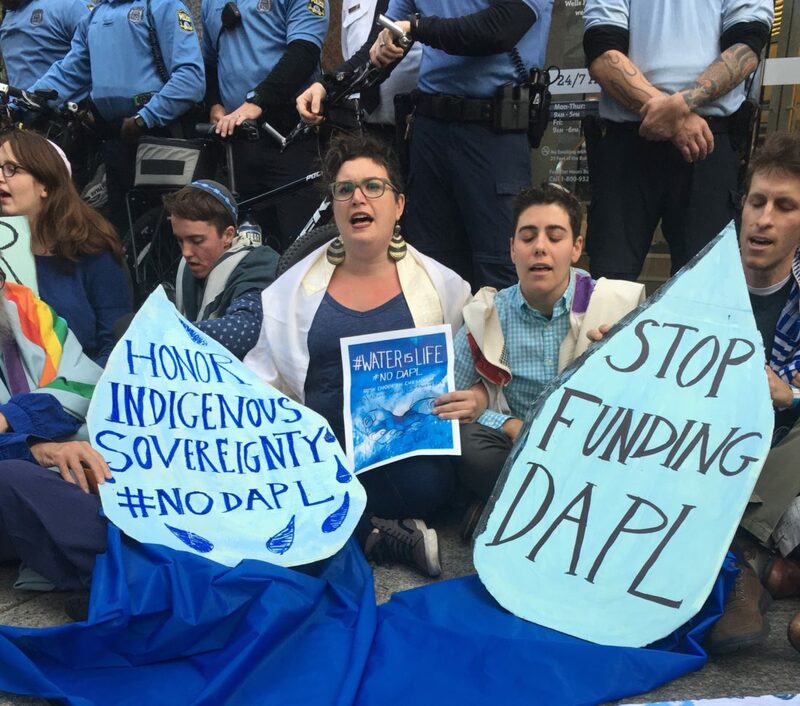 November 2, 2016 – Nine rabbis, rabbinical students and Jewish community members were arrested in a civil disobedience action protesting the construction of the Dakota Access Pipeline at a TD Bank on Market Street in Philadelphia Wednesday evening. The rabbis led the crowd in Jewish ritual and songs, praying for water and honoring indigenous sovereignty, in front of a Wells Fargo bank before marching down the street to stage a sit in at a TD Bank on Market Street. Over 200 community members joined the demonstration in solidarity with an urgent call from native organizers in North Dakota leading the resistance to the Dakota Access Pipeline. Last week militarized law enforcement moved in with tanks and riot gear against the water protectors who stand in opposition to the Dakota Access Pipeline. Over 140 people were arrested and there were reports of rubber bullets and other projectiles, mace and pepper spray, and other forms of state violence against the peaceful water protectors. Just today, law enforcement again used similar force against peaceful activists. The proposed pipeline is a massive project that would impact the water source of the Standing Rock Sioux Tribe, and violate sacred sites and ancient grounds. Tens of thousands of people including native leaders from all over North America have joined the peaceful resistance to the pipeline’s construction. In answer to an urgent call for solidarity from Native leaders at Standing Rock, local rabbis, Jewish community members and allies took the struggle to Wells Fargo and TD Ameritrade, two of the banks that are financing part of the pipeline’s construction. “In the week in which we read in the Torah the story of the great flood and Noah’s Ark and in which we begin the Hebrew month of Cheshvan, we immerse ourselves in liturgy and narrative about water. Now is the time to honor Native rights and environmental justice by taking action in solidarity,” said Rabbi Ari Lev Fornari, Kol Tzedek Synagogue who was arrested in the demonstration.